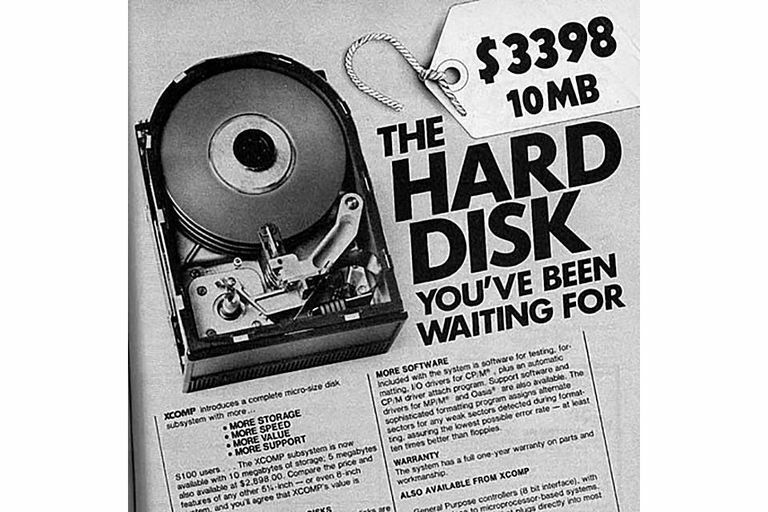 advertisement for a 10 MB XCOMP hard disk drive. All of our computers, big and small, have hard drives of some type and most of us know that it's the piece of hardware that stores our software, music, videos, and even our operating systems. 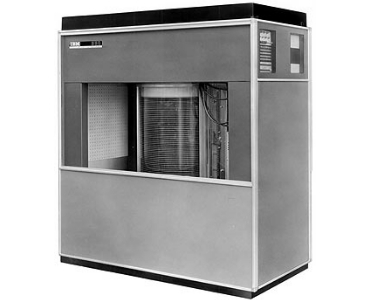 The very first hard drive, the 350 Disk Storage Unit, didn't just show up on store shelves out of nowhere but was part of a complete computer system by IBM, released in September 1956... yes, 1956! IBM started shipping this amazing new device to other companies in 1958 but they probably didn't just stick it in the mail - the world's first hard drive was about the size of an industrial refrigerator and weighed north of one ton. Shipping that thing was probably last on any buyer's mind, however, considering the fact that in 1961 this hard drive rented for over $1,000 USD per month. If that seemed outrageous, you could always purchase it for a little over $34,000 USD. An average hard drive available today, like the 8 TB Seagate model at Amazon that sells for a little over $200 USD, is over 300 million times cheaper than that first IBM drive was. If a customer in 1960 wanted that much storage, it would have cost her $77.2 Billion USD, a little more than the entire GDP of the United Kingdom that year! IBM's expensive, monstrosity of a hard drive had a total capacity of just under 4 MB, about the size of a single, average-quality music track like you'd get from iTunes or Amazon. Today's hard drives can store a bit more than that. As of late 2015, Samsung holds the record for the largest hard drive, the 16 TB PM1633a SSD, but 8 TB drives are much more common. So just 60 years after IBM's 3.75 MB hard drive was the best of the best, you can get over 2 million times as much storage in an 8 TB drive and, as we just saw, at a tiny fraction of the cost. Bigger hard drives don't just let us store more stuff than we used to be able to, they enable entire new industries that simply couldn't have existed without these major advances in storage technology. Inexpensive but large hard drives let companies like Backblaze provide a service where you back up your data to their servers instead of to your own backup discs. In late 2015, they were using 50,228 hard drives to do that. Consider Netflix, which, according to a 2013 report, needed 3.14 PB (around 3.3 million GB) of hard drive space to store all of those movies! Think Netflix's needs are big? Facebook was storing close to 300 PB of data on hard drives in mid-2014. No doubt that number is a lot bigger today. Not only has storage capacity increased, but size has also decreased at the same time... drastically so. A single MB today takes up 11 billion times less physical space than a MB did in the late 50's. Looking at that another way: that 256 GB smartphone in your pocket is equivalent to 54 Olympic-sized swimming pools completely full of 1958-era hard drives. In many ways, that old IBM hard drive isn't that different than modern hard drives: both have platters that spin and a head attached to an arm that reads and writes data. Those spinning platters are pretty fast, usually turning 5,400 or 7,200 times per minute, depending on the hard drive. All those moving parts generate heat and eventually start to fail, often times loudly. The soft noise your computer makes is probably the fans circulating air but those other, irregular ones, are often times your hard drive. Things that move eventually wear out - we know that. For that, and some other reasons, the solid state drive, which has no moving parts (it's basically a giant flash drive), is slowly replacing the traditional hard drive. All that means is that we'll need to store data in different ways in the future. A lot of sci-fi sounding technology is in development right now, like 3D storage, holographic storage, DNA storage, and more. Speaking of science fiction, Data, the android character in Star Trek, says in one episode that his brain holds 88 PB. That's much less than Facebook, it seems, which we're not sure exactly how to take. Terabytes, Gigabytes, & Petabytes: How Big Are They? Are Hard Drive Failures Increasing? 13 Things You Didn't Know About "The Sims 3"
Why Does My Hard Drive Store Less Than Its Capacity?